Marching Home: To War and Back with the Men of One American Town. This book is the story of six Freehold veterans of World War II, and how they changed their world. You can order the book on Amazon.com,. or get it now... in stock at the Freehold Barnes & Noble. 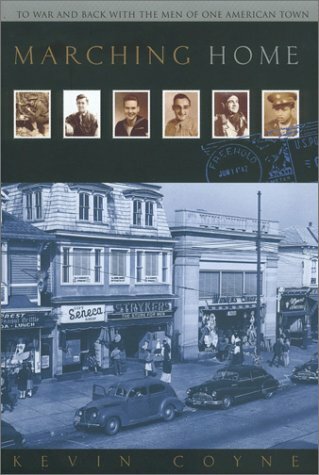 A compelling story of World War II, and how it shaped the lives of six men, one town, and America. Of the 16 million Americans who served in the armed forces during the war, not quite a thousand came from Freehold, New Jersey - an old courthouse town busy with factories, ringed by fields, and home to a diverse populace that reflected the varied faces and aspirations of the nation. Marching Home follows six young men from this town as they are swept overseas into a conflict more vast and vicious than any other in history - into the Army, the Navy, the Air Corps; to Europe and the Pacific; from Tarawa to the Bulge, from Normandy to Leyte. And once their battles are won, the book follows the men back home again, to a town, and a nation, poised for changes larger than any of them had imagined. Farms and factories flourish, then fade; Main Street blooms, then withers; the bonds of community tighten, then fray. A black soldier endures segregation in the Army, and racial unrest on the streets of home. An airman bombs the enemy to rubble, then builds new houses and stores for his neighbors. A sailor faces a kamikaze hurtling at his ship, then walks a police beat back home, trying to keep the peace. Marching Home tells the rich story of these men and their lives in a town that, with its rare mixture of village intimacy and city diversity, offers a remarkable microcosm of the whole sweep of twentieth- century - the story of what America was then, in its hardest hours, and how it became what it is now. "Although Kevin Coyne does give a finely rendered account of what close combat felt like in World War II, what makes this book original, I think, is something else. It's the way he follows his warriors home to a country quite different from the grateful nation of Greatest Generation cliché. They return to a community riven by labor strife, racial tensions, political corruption, and suburban sprawl that changes, almost unrecognizably, the town that sent these men off to war. There is an ancient truth here; no matter how great the military victory, its aftermath is never triumphant." "I cannot think of any more appropriate coincidence than the fact Kevin Coyne and Bruce Springsteen share the same hometown, Freehold, New Jersey. It's the place that inspires the art of both these men, one of whom is rightly revered and one of whom should be after this extraordinary book. What Kevin Coyne does in Marching Home is what Springsteen has done in so much of his music - bear witness to the struggle and honor of ordinary lives, capture the preciousness of community and the tragedy when community is lost. Where so many other books about World War II and the greatest generation end neatly with victory, Coyne follows his characters all the way from battlefield valor through imperfect peace. This journey across the decades is an unforgettable work by a breakthrough writer." "Master storyteller Kevin Coyne follows six boys from his hometown who helped win a war and build a country. I so enjoyed this heartfelt book about the boys who fanned out across the globe and marched home to face a whole new series of battles."